Want to learn how to raise more money for your nonprofit? Laura offers grant writing and fundraising workshops and presentations for nonprofit staff and board members. Programs for all needs and budgets. 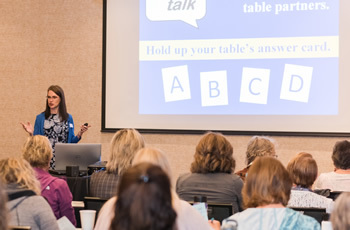 From 1-hour presentations, to half-day workshops, to full days of training. Contact Laura to learn more or schedule a training! In this full-day high-touch, hands-on workshop, you'll learn effective strategies for researching and writing foundation grants. This workshop combines lecture, group discussion, and hands-on activities to reinforce course material. You'll practice with more than a dozen exercises and leave with new ideas and actual writing samples that can be incorporated in your next grant proposal. There's more to grant writing than just "writing." A lot more. This half-day workshop covers the basics of foundation grant research and grant writing. You'll learn how to find your best prospects and write your own grant proposals. If Google is the only research tool you're using, you're only scratching the surface of grant possibilities. Participants will learn how to research foundations to find their very best grant prospects. Are you looking for a grant to fund your nonprofit's work? If you've never written a grant before, or if you've written a few without much success, then this program is for you. Learn the basics of successful grant writing. This half-day workshop explores the art and the science behind fundraising appeals. In this fast-paced session, you'll learn what works and why. You'll also learn what you need to consider and do before writing your next letter. In this half-day workshop, you'll learn the 4 simple steps to keep more donors and raise more money. You'll look at real-life appeals, thank you letters, and reports that illustrate what to do (and what not to do!) if you want to raise more money. Grants are great, but they aren't the only way for a nonprofit to raise money. This short, interactive session will explore where nonprofits get their funding and challenge you to rethink where your organization gets yours. Whether you're an experienced fundraiser or just getting started, you'll be surprised by what you don't know - and that could be holding you and your fundraising back. This fast-paced session will separate fundraising facts from fiction. Direct mail is NOT dead. And chances are you could be raising a lot more money from your letter writing campaigns - if you were writing better letters. In this short introductory session, you'll learn tips and tricks for a successful direct mail campaign. No child grows up saying, "One day, I want to be a fundraiser!" So, it's no surprise that so many staff and board members struggle with - and even fear - fundraising. This short session separates the facts from the fiction. Every U.S. nonprofit has a Guidestar profile, but fewer than 3% have the Guidestar seal of transparency. Yet, with a little guidance, a little information, and in as little as 15 minutes, you can earn a Guidestar seal of transparency for your nonprofit. Laura also offers Customized Nonprofit Training tailored to your specific needs. Don't see what you're looking for? Contact Laura about additional workshops.